Hennessy Hammock is well-known for their distinctive asymmetric tarp design that come stock with every hammock, but not everyone feels “storm secure” with them. And, there are certainly times when having a larger tarp is preferred. The Monsoon tarp, and its bigger brother the Typhoon, have larger side panels and “blast panels” (commonly known as “doors”) on each end to provide 360-degree rain protection. The side panels include catenary-cuts with a center pull-out resulting in a total of eight (8) guy points to ensure the tarp stays taut in rough weather. Like all Hennessy products, there are ample mitten hooks strategically located at each tie-out point. These clips can be used in a variety of ways, including attaching water collection devices, shock cord for tarp tensioning, or even to hold out the hammock side pull-outs. The doors on the Monsoon can be easily removed and connected thanks to hook-and-loop fabric on the edges and toggles that clip to the tarp corners. a strategically-placed slit in the door allows the hammock suspension to fit perfectly. Another distinctive feature of all Hennessy tarps are the storage pockets at each corner to store the guyline. The tarp also comes with shock cord for each guy point to provide tension relief in gusting conditions. 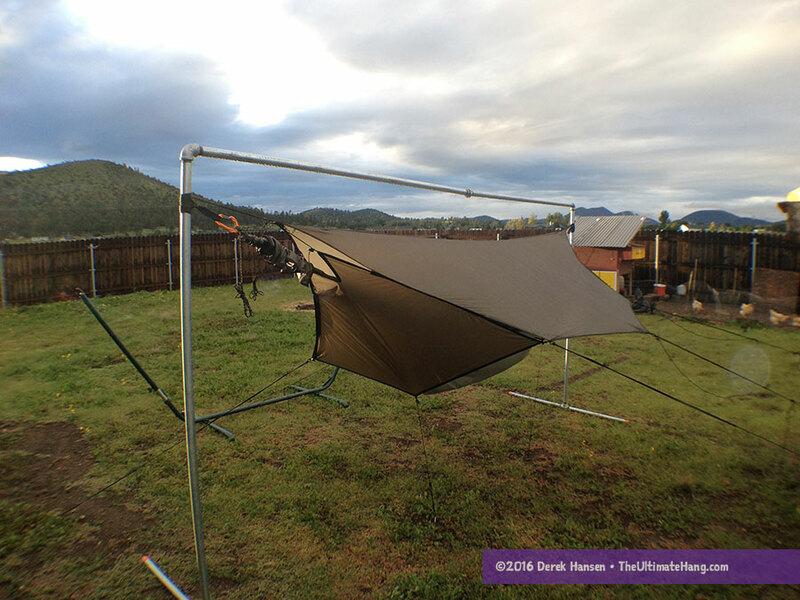 The Monsoon tarp is designed to attach directly to the Hennessy Hammock suspension but can be hung independently. 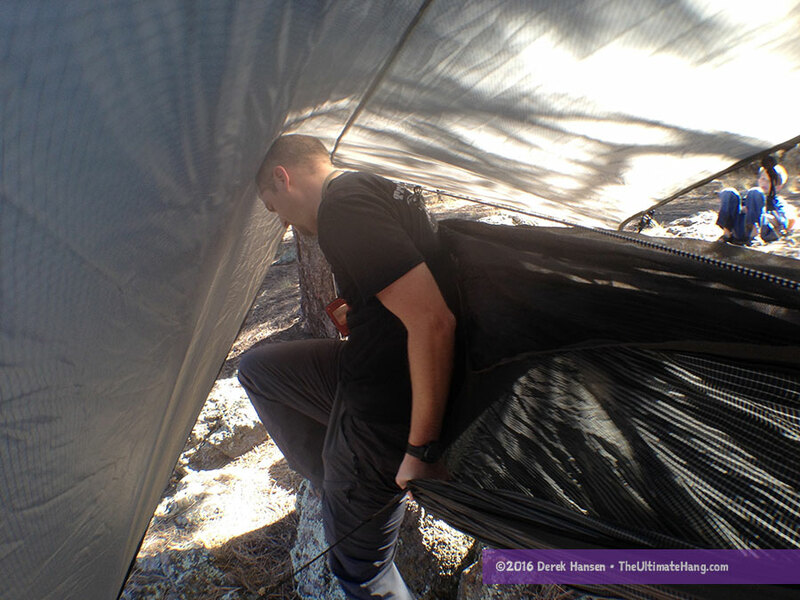 For maximum protection, it is best that the tarp is attached close to the ridgeline of the hammock so the underside of the hammock remains covered. NOTE: The Monsoon is designed for the Expedition, Backpacker and Hyperlight hammocks and the Typhoon is designed for the Explorer and Survivor series. I’ve used the Monsoon tarp on several trips over the past year. My primary purpose in reviewing this tarp was for research for my new book, but I’ve come to enjoy the security, privacy, protection, and pack weight. I’ve always enjoyed how the Hennessy Hammock works as a unified system with all the parts matching up. Using the Monsoon with a few different Hennessy Hammock models I had on hand (Expedition, Deep Jungle, and Hyperlite) all worked well. For a winter tarp, it is small. Most after-market winter tarps have generous proportions with ridge lines starting at 132 in (335 cm) and 100+ in (254 cm) panels—large enough that two hammocks—or one hammock and a lot of winter gear and a pulk—could fit easily underneath, with the side panels tacked to the ground. The Monsoon, in contrast, provides similar protection, but in a concise package. The Typhoon has a longer ridgeline (130 in/330 cm vs 120 in/304 cm) but similar-length side panels. In my opinion, Hennessy Hammocks have always appealed to the hiker/backpacker because everything is slim, trim, and designed for efficiency and weight economy. The Monsoon/Typhoon tarps follow this mantra by shaving off as many ounces but still providing the most protection. 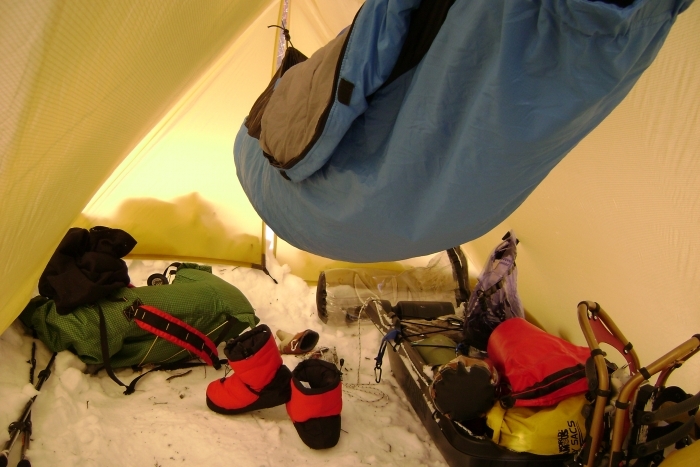 A typical winter hammock tarp provides lots of vestibule space for gear. For me, I don’t mind the snug fit. The package is lighter but still full-featured. The compromise is headroom and vestibule space. As I mentioned, for best protection, it helps to keep the Monsoon pitched close to the hammock ridgeline. 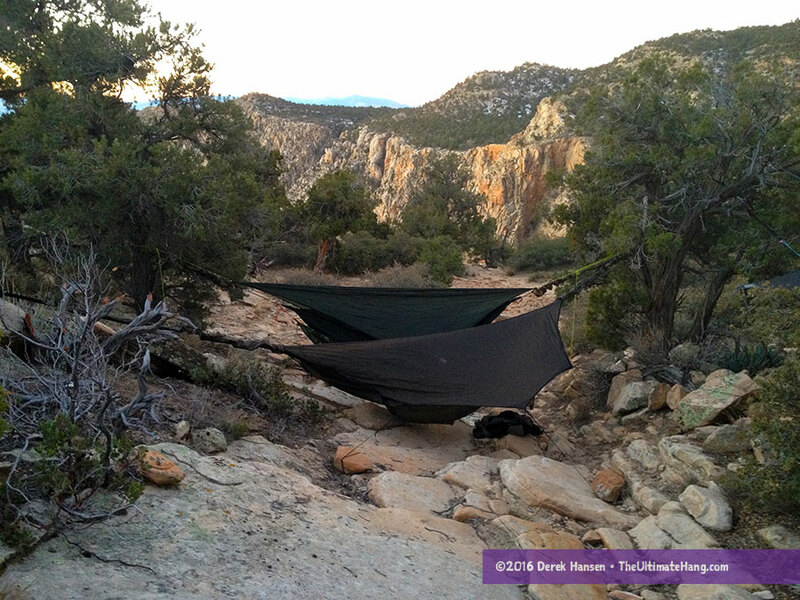 Hennessy has one of the smallest headroom (hammock-to-ridgeline distance) of hammocks with bug nets, and that translates to similar headroom with the tarp when pitched close. If conditions aren’t too bad, you can pitch the tarp higher above the hammock, but you’ll need to use a separate ridgeline cordage. You can also pull one side open into a porch mode if you disconnect the doors. Speaking of the doors, they are not traditional “doors” like you might see on other winter-style tarps. Other tarps in this category use extra fabric on the side panels that turn in to make opposing doors that each close off half the end space. The doors on the Monsoon/Typhoon are full panels that enclose the entire end space of the tarp. This limits the ways in which the tarp can be pitched if you want to have the doors enclosed. In fact, if the tarp panels are pulled out too far with the doors attached, you risk damage to the doors (believe me, I know from personal experience!). It is best to unhook/untoggle one side if you want to pull the tarp open. The Monsoon provides great storm protection. I’ve slept several nights in the Arizona monsoon season with sideways wind and rain and been completely dry. It’s convenient to have all four sides of the tarp enclosed and protected because I don’t have to worry so much about site selection, especially if I’m in a location where options are limited. I also like the privacy and snug feel, knowing that I’m not wasting any space or weight. The tarps color also provides better shading than the more common “Shark Grey” silnyon tarps, helping to block out sun and moonlight that can disturb a nights’ sleep. 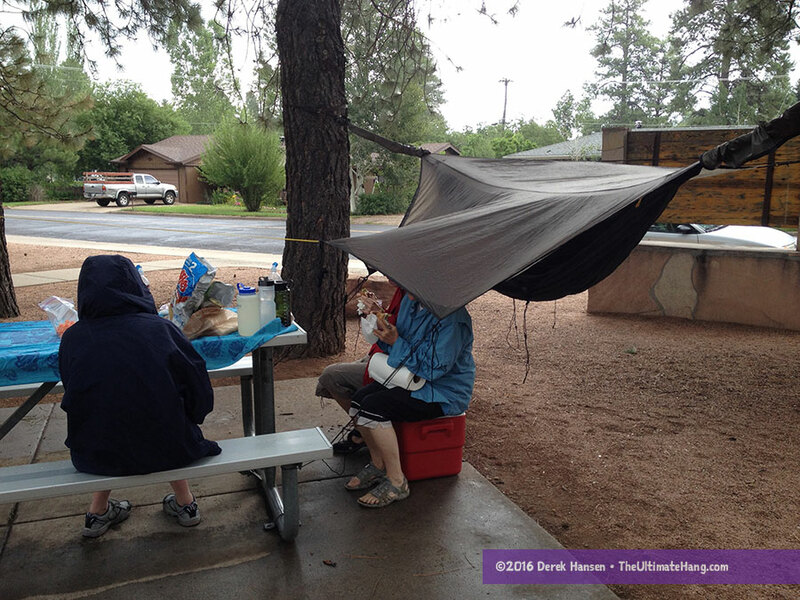 Here, I used the Monsoon tarp and pitched it in a porch mode to provide a little shelter for family during a picnic. You can see that the doors are removed to allow for this configuration. The Monsoon provides ample storm protection but in a small package, great for lightweight backpacking in tropical environments or other heavy wet conditions. I think it is ideal for those looking for economy, efficiency over porch or vestibule space. It’s a great fit for Hennessy Hammocks and hammocks up to 9.5 ft (~2 m) long. Asymmetric hexagon with six perimeter tie-outs and a single guy point for each door for a total of 8 tie-outs. This is a topic I’ve been trying to find an answer for a while and have looked at the Monsoon and Typhoon. I have a HH Deep Jungle Asym Zip XL and want a more storm proof tarp for when the weather is really bad and have a little more head clearance. I’ve looked at the JRB universal, WB superfly, tadpole and OES 4 season tarps. Any recommendations? Your the most experienced one on these things and it might save me from buying multiple tarps 🙂 For the Jungle XL, I’m not sure if those would be a good fit or oversized length wise. Any experience with those or have an idea on what to recommend? Thanks as always. Nice to see your reviews here and on YouTube. For more head clearance and vestibule space with 4-door storm protection, the Warbonnet Superfly or the Underground Quilts Winter Dream are two great options. They already come with doors and the side panels are wide enough that you can get all kinds of great protection while still allowing for great head room. The Winter Dream looks awesome. Any idea which length would be best for a Jungle XL? I just checked the ridgeline length and any would work. Would this be long enough for a Dutch 11ft hammock? Barely. Depends on your ridgeline length (how much sag you put in the hammock) and how much hang over distance you prefer. The Typhoon will give more end coverage. My wife and I got Typhoon flies for our Hennessey Explorer Classics last Autumn because I was concerned about rain blowing in. Based on the description and photos on the website, I actually thought it was the hex fly with removable doors and would have been happy with that. Not close. What the Monsoon and Typhoon do have going in their favor is that their minimalist size and greater number of tieouts should hold up better in high winds. For gear stowage we went with a Scout Zip demo. How did the tarp hold up? I was thinking about getting this tarp but I’m not sold on it. I use a HH Expedition. The tarp holds up great. Just have to be careful not to over reach the doors so the seams don’t tear. It is a snug tarp. So if you’re looking for a roomy or cavernous winter palace, I can give other recommendations. This tarp had its place and an audience but it’s not for everyone. Hennessey should offer the same removable style doors for their hex flies. 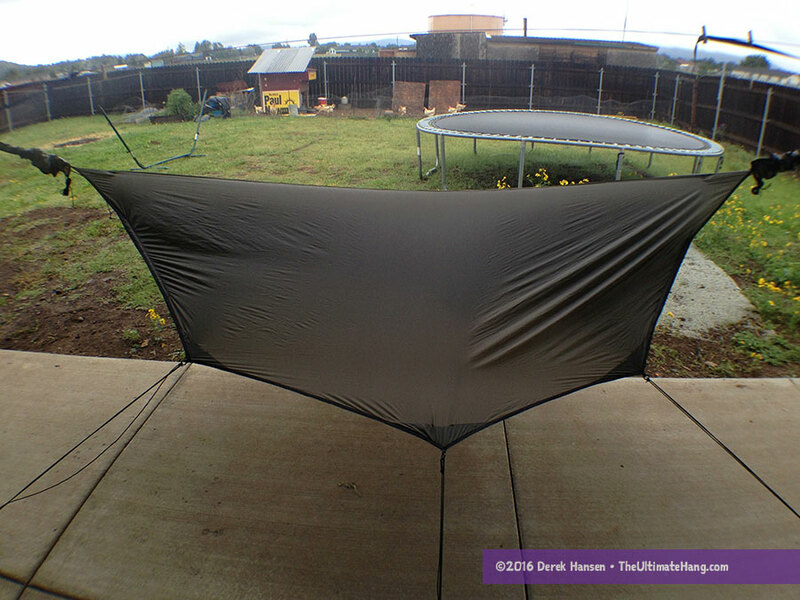 Hey Derek, would this tarp work well with a Warbonnet Blackbird? It would be a tight fit. Get the bigger typhoon.